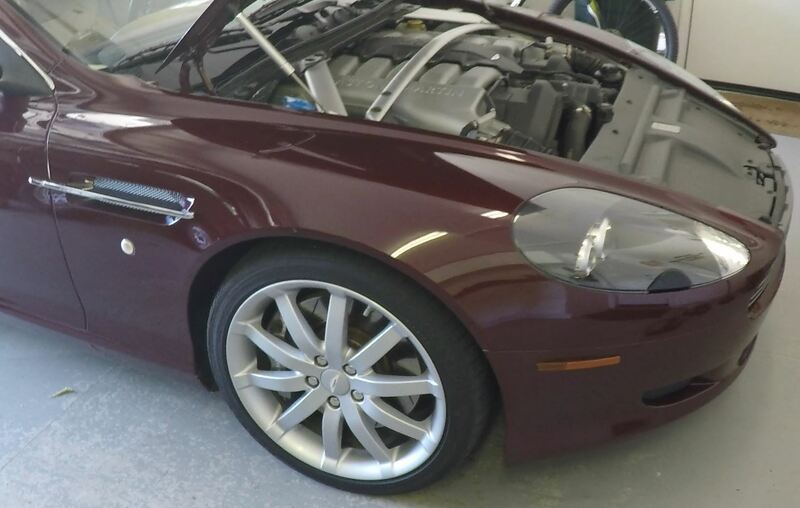 Before you begin any work under the hood (bonnet) on your DB9 you should consider if there is a chance you might scratch or damage one of those gorgeous fenders (wings). One momentary mistake could lead to much anguish should a spanner go awry, not to mention the buttons or zipper from your jeans or jacket. Personally I don’t cover them up if I am just checking the oil or just having a peek under the hood, but if I am performing any real service I definitely cover them up. 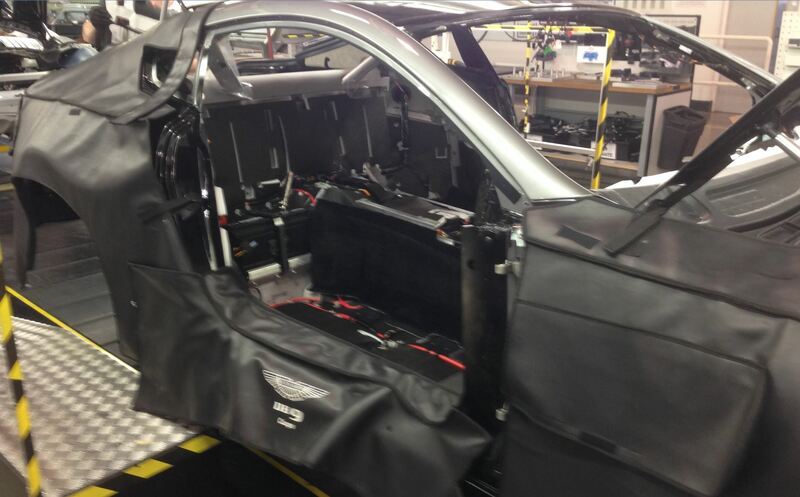 Aston Martin has an official Vehicle Protection Kit they say main dealers should be using, not that I’ve ever seen one in person, check out this photo. Since I don’t happen to have an entire auto condom or 2 helpers to fit it, I make due in other ways. A traditional service shop will use generic fender covers you can purchase at the local auto supply store. Usually vinyl tops and some form of foam under side. Here is my problem with these. They might be perfect when they are brand new and perfectly clean on the foam side that contacts the paint. BUT if they get any dirt on them they become essentially a scratch pad rubbing against your fender. Really not good. I would argue that any used fender cover will be dirty on the bottom no matter how hard I try to keep it clean. Wash the car BEFORE putting on a fender cover. This removes the dirt that might act like grit if left in place. Simple, effective and inexpensive. Use clean, plush bath towels as fender covers. Just lay them over the fender and tuck them in near the hood hinges to hold them in place. Simple, effective and inexpensive. Since they are clean each time they should be free of any damaging grit. The plush also acts as a bit of a cushion as well if you lean across the fender. Wash them after any use. Remember, you’re goal is to keep these really clean so they protect the car. I have a pair of old towels that my Sweetie donated to me for garage use, and she was happy to have this excuse to buy some new towels for the house too! I suppose you could jazz up this solution by putting generic vinyl fender covers over the top of the towels. This would have the added benefit of preventing and fluids spilled on them from soaking through the towel. 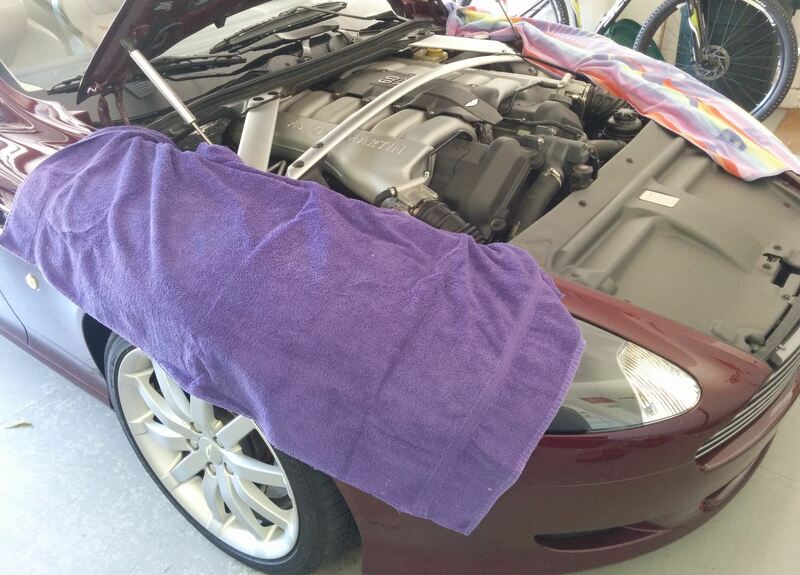 For example, brake fluid would be a disaster if spilled on the towel and soaking through to the paint. Just a simple suggestion to help protect your DB9 while you are crazy enough like me to work on it. Here is a simple video showing the size of towel I am using and how I tuck it into place. Again, thank you Steve for one more great idea. You’re Welcome. Not a fancy solution, but works.